Tá Sinn Féin tar éis scríobh ag Fianna Fáil ag iarraidh go mbeadh an páirtí soiléir maidir le cén mhúinín atá aige san Aire Sláinte,Simon Harris. D'iarr Mary Lou McDonald ar Mhicheál Martin an dtacódh sé le rún mí-mhuiníne san Aire Harris. Tá sé ráite ag Fianna Fáil gurb é an rud is tábhachtaí anois go bhfaigheadh an páirtí amach go baileach céard a tharla i dtaca le róchaiteachas, agus nach dtarlóidh sin a deir sé má éiríonn Simon Harris as oifig. Dúirt Micheál Martin áfach níos túisce inniu gur cheart don Aire Sláinte leithscéal a ghabháil leis an Dáil. Dúirt Louise O’Reilly, urlabhraí sláinte Shinn Féin ar RTÉ ar maidin, gur cheart go mbeadh an tAire Airgeadais agus Caiteachais Phoiblí, nó oifigigh sa Roinn curtha ar an eolas ag Simon Harris i mí Lúnasa 2018 faoin róchaiteachas, sé sin roimh Lá an Bhuiséid. Deir sí nach ndearna sé amhlaidh go dtí an 9 Samhain, agus gur choinnigh sé an t-eolas óna chomhghleacaithe Rialtais ar feadh 10 seachaine go leith. Dúirt an Taoiseach ar maidin go bhfuil 'muinín iomlán' aige as an Aire Sláínte Simon Harris. Dúirt Leo Varadkar dá mbeadh sé inste ag Simon Harris níos luaithe leis faoin róchaiteachas ar an Ospidéal Leanaí, go mbeadh an treoir a thabarfadh sé dó ar aon dul leis an méíd a rinne an tAire Sláinte as a stuaim féin: 'na roghanna ar fad i leith scála an togra a laghdú a mheas, agus costas cruinn deiridh a shocrú'. 'Scéal thairis', a thug An Taoiseach ar an gcaint go mbeadh tionchar aige seo ar Bhuiséad 2019. Dúirt Leo Varadkar gur beartais ilbhliantúla iad na fógraí faoi chaiteachas caipitil, agus gur fógraíodh iad sin mí Feabhra 2018 agus ní ar lá an Bhuiséid. 'Cuireadh €1.5bn le buiséad caipitil 2019', a dúirt sé, 'agus nach mbainfear de sin de bharr an róchaiteachas seo ach €100m. Dúirt sé go bhféadfaí an tsuim seo a láimhseáil'. 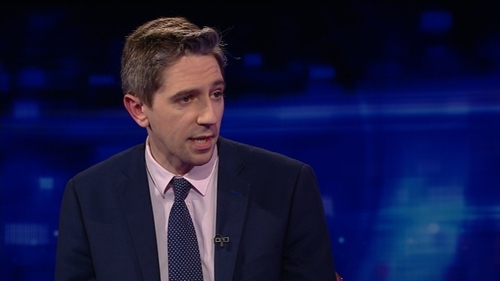 Rinne Simon Harris cosaint aréir ar an gcaoi ar láimhseáil sé an t-eolas a bhí aige faoin róchaiteachas ar an ospidéal. D’fhoilsigh sé meamram ó Lúnasa 2017 a dúirt go raibh an buiséad tógála €191m níos airde ná an meastúchán ba dheireanaí roimhe sin. Dúradh sa mheamram freisin gur chuir na príomhthógálaithe isteach ar chostais bhreise substaintiúla timpeall €200m. Thug sé seo an róchaiteachas iomlán san ospidéal chuig €391m. Deir an tAire Sláinte nach raibh a fhios aige cé na figiúirí deiridh go dtí an 9ú Samhain agus gurbh é sin ‘an t-am cuí’ leis an Taoiseach agus an Rialtas a chur ar an eolas. I gcáipéisí eile aréir, taispeáineadh gur iarr oifigigh ón Roinn Sláinte ceist an róchaiteachais a ardú leis an Roinn Airgeadais agus Caiteachais Phoiblí chomh fada siar le mí Mheán Fómhair ach nár tharla cruinniú idir baill foirne ón dá Roinn go dtí mí na Samhna. Dúirt Alan Kelly ó Pháirtí an Lucht Oibre go bhfuil an Rialtas ‘ag tiomáint agus iad ina gcodladh’ agus é a cur síos ar bhainistiú an togra. Dúirt an Tánaiste Simon Coveney gur polaitíocht uilig atá sna hiarrachtaí a bheith ag cur an mhilleáin ar an Aire Sláinte, Simon Harris faoi chostas Ospidéal nua na nGasúr. Dúirt Coveney go bhfuil chuile dhuine, agus go speisialta an tAire Harris díomách faoin ardú a tháinig ar chostas an ospidéil. Thug na Daonlathaigh Sóisialta le fios go dtacódh an páirtí le vóta mí-mhuiníne ar bith a chuirfí san Aire Sláinte sa Dáil agus dúirt siad go bhfuil sé dochreidthe go bhfuil an Taoiseach ag seasamh leis.